WhichSchoolAdvisor.com Consultancy is a paid for service for those of you either already in the UAE, or who are moving to the country who would like help finding a school, or in getting education advice on curricula and schooling in the emirates. IT IS EASY TO BECOME OVERWHELMED BY THE NUMBER OF SCHOOLS, DIFFERENT CURRICULA ON OFFER, RECOMMENDATIONS AND REPORTS FROM COLLEAGUES, AS WELL AS FRIENDS OR OFFICIAL SOURCES. WE WILL GUIDE YOU IN DETERMINING WHICH SCHOOLS TO APPLY TO, AND TO HOW MANY THROUGH OUR BESPOKE RANGE OF CONSULTANCY SERVICES. Our team of dedicated consultants, who have many years of experience working in the UAE education and relocation sectors, can guide you through the wealth of information available, using their direct knowledge of the education sector in the UAE, their personal contacts with the schools and the most up-to-date information on availability of places, to assist you in your search. Demand for school places at the most sought-after schools in the UAE currently significantly outstrips supply, but there are many good alternatives and WhichSchoolAdvisor.com’s team can assist you to identify them, guide you through the application process, and as required, provide a range of additional services to simplify the process for you. Most companies recognise that the provision of suitable schooling is a key priority for their executives and can make or break the decision on their relocation. In general, Corporate HR Departments do not have the detailed knowledge of the education sector in the UAE that we can offer. 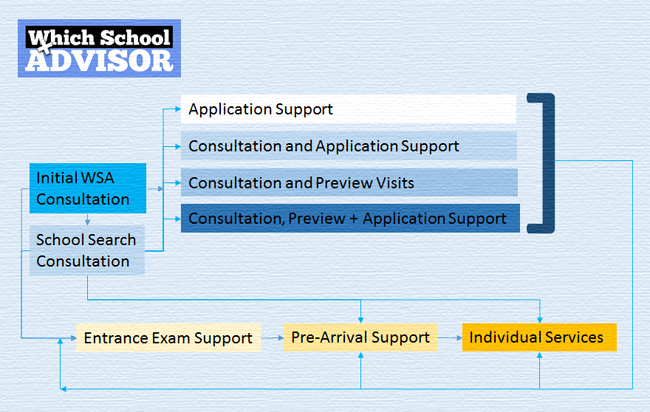 WhichSchoolAdvisor.com’s Consultancy services are the first to specialize in this specific sector in the UAE. Although we cannot guarantee acceptance of your child(ren) at your chosen school(s), we believe that by carefully targeting appropriate schools, we can ensure that you do not waste time, effort and money on applications that will not be successful or in choosing a school that is inappropriate for your child(ren) with the enormous additional financial and emotional cost involved. If you are interested in these services, please go to http://schoolsqanda.com/details-consultants/. 1. General consultation (Fee for first consultation: 300 USD). Up to 1 hour of telephone/Skype (or if necessary, due to time differences, email) consultation to provide a general overview of expat life and the educational provision in the UAE, advice related to any specific concerns, general rules and regulations related to enrolment dead-lines and cut-off dates, equivalency between differing curricula, UAE versus southern-hemisphere academic timings and grade implications. The aim of this service is to provide you with a general overview of expat life, to enable parents to determine whether the education provision in the UAE is likely to be suited to their child(ren) and to address any specific questions related to a possible enrolment in the UAE. Most parent will take this forward to Step 2. If you would like, you may start at Step 2. If you are interested in these services, please go to http://whichschooladvisor.com/details-consultants/. Based on completion of a detailed Needs Analysis, our consultant will carry out a briefing call (by telephone or Skype) to determine exact requirements, ensure that we have a clear understanding of any specific issues or concerns and based on this information, research and advise on suitable schools to which application should be made, based on the latest information about availability of places in the appropriate year groups/grades. We will provide you with detailed information about the curricula and schools in which you are interested, and the pros and cons of applying to them. If we need to follow up for specific information, we will do so and respond back to you – although this will be charged separately). We can guide you through the application process, and advise you on the process and time-lines in terms of acceptance of applications and offer of places. For many parents this step will be enough to be able to take decisions with confidence that they understand schools in the UAE. However for those that would like to, we offer addition support – see steps 3 through to 8. Once the consultation process is complete, our consultant will provide you with additional support through direct intervention in the application process and follow up with the schools to which you have applied on a bi-monthly basis. This service includes transfer of application fees and documents for all schools and children (to a maximum of 4 schools) to WhichSchoolAdvisor, whose consultant will personally deposit payments and documents at the schools concerned, ensure that the application is being processed by the schools and obtain regular feedback on the status of the application. Designed to support employees who may not yet have made a decision to relocate, or have made the decision but wish to familiarize themselves with their new posting, this service includes all the support included in our Initial Consultation, together with the arrangement of visits to suitable schools, meetings with the Admissions team, tours of the schools (subject to availability), and guidance through the application process. * A day is usually a maximum of 7 hours face to face contact with our consultant and is subject to school opening hours. We will also include an Area Orientation of the immediate residential areas in the locality of the schools and drive by suitable housing options (based on your likely housing budget), so that you can identify these in advance of making a decision on your relocation or prior to commencing your Home search. * Please note that internal viewings of properties are not included. Combining all of the above elements, this service is designed to assist you from the initial research, through visits to the pre-selected schools, Area Orientation and the application and follow up processes. * A day is usually a maximum of 7 hours face to face contact with our consultant and is subject to school opening hours. Although some schools permit students to sit entrance exams in their Home Country, it is not unusual for students to be required to take the exam at the school to which they are applying. In many cases, a conditional offer of a place will be made dependent on the results of the entrance exam. We will coordinate with the school(s) concerned to arrange the appointments for your child(ren) to take the exam, will transport you and your child(ren) to the school and transport you back to your accommodation. Whilst the child(ren) sit(s) the exam, we will provide an Area Orientation of the residential areas in the immediate locality of the school. * A maximum of 2 hours will be included for the Area Orientation. Our Consultant will assist you with all the running around required to organise that first day of school, including taking you to the school prior to the start date, to make any final arrangements (payments, school bus fees, books etc.) and to the school uniform providers to ensure that your child(ren) start(s) the first day of school with everything in place. * A day is usually a maximum of 7 hours face to face contact with our consultant and is subject to school opening hours. The UAE Education sector is still relatively young and is not, perhaps, as developed in its provision of support to children with Additional Learning Needs as other parts of the world. As a result, the level of support available for children with Special Educational Needs or English as an Additional Language/English Language Learner requirements is often limited. Many schools are only able to offer very limited places to children with Additional Needs and the degree of assistance that is offered varies enormously. Whichschooladvisor.com Consultancy has successfully assisted families with both SEN and EAL requirements, but the amount of effort and time required to support this service is considerably greater than the usual service and for this reason, we charge an additional fee for such cases. There is a minimum of USD 1,000 per day (7 hours) of support provided in addition to our basic fees shown against each service. Should you require additional support to address specific questions or issues you may face in placing your children, please contact us directly through the website with brief details of your query and we will advise you of our ability to support your request and our fees. If we are not able to assist you directly, we will do our best to provide suggestions for alternative service providers.